Record trade, infrastructure projects, world-leading environmental research and a busy community sponsorship program are among key achievements highlighted in North Queensland Bulk Ports’ 2017-18 annual report, tabled in Queensland Parliament last Friday. A record 187.7 million tonnes of throughput passed through NQBP’s four operating ports and net profit after tax was $5.0 million. NQBP paid an annual dividend of $6.0 million to the state. NQBP’s new chief executive officer Nicolas Fertin, who began on 17 September 2018, congratulated the team on the result. “While I have only recently begun at NQBP, our commitment to facilitating trade, developing opportunities and investing in our ports and our people is clear in this result,” Mr Fertin said. “Our role is to bring together business, environment, community and strategic stakeholders to make our ports sustainable for everyone in the long term. The flagship infrastructure project for the 2017-18 year was a $9.8 million upgrade at Port of Mackay to allow roll-on roll-off (RORO) vessels to berth. The new capability has been welcomed by local operators in the Bowen Basin, who now have additional options to ship oversize overmass cargo directly into central Queensland. 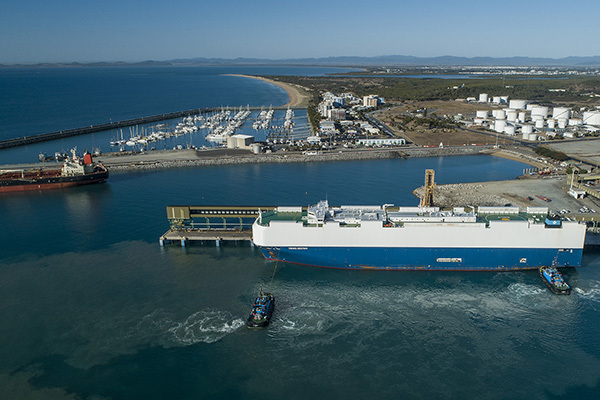 The Port of Mackay hosted its first RORO ship last month. With three priority ports in the Great Barrier Reef World Heritage Area, NQBP also has a strong focus on environmental research and innovation. Building on a long history of collaboration between industry and science, NQBP entered a three-year $3 million partnership with James Cook University for its TropWATER department to deliver a rigorous marine quality and habitat program. NQBP and the university recently announced a new internship program, which will give two fortunate students the opportunity to spend four weeks in the field and at NQBP, gaining invaluable real-world experience in marine port science. During the year, NQPB also delivered its first online environmental dashboard that shows 24/7 real-time air quality data for sites around the ports of Hay Point and Mackay. Further online dashboards under development will share data from NQBP’s seagrass and coral monitoring. Meanwhile, NQBP pilotage also experienced a record year, with marine pilots executing 2,836 ship movements at the ports of Mackay and Hay Point. As part of NQBP’s major community investment program with the North Queensland Cowboys, port communities were visited by current and ex-players over the course of the year. A two-day Bulk Port Blitz in each port location included visits to local schools and free skills sessions and motivational talks with junior rugby league players.